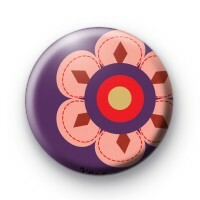 Purple and pink flower badge. This fun retro floral design is lovely to give as a handmade gift or to pin to your coat/bag to jazz up any outfit. It is a pretty and simple design but the bold colours make it stand out. We have quite a few pretty, bright and fun flower themed badges in the shop, so if you're looking for a few more options be sure to have a browse through those before checking out. We handmade all our badges in the UK.